Why should you buy A Versaclimber? Exercises are an important aspect of one’s healthy living. Home-based fitness machines are a suitable way of incorporating regular exercise into one’s life; or better still, making these sessions conveniently accessible. For athletes, trainers, or any other people who are basically willing to invest in a mountain climber machine appropriate for homes or gyms; this is the right read for you. Read on to learn all you need to know in regards to Versaclimber machines. These are some of the most popular climber machines available in today’s market. A Vertical climber is one of the most popular mountain climber exercise machine in the market today. Sports experts say that Vertical climbers provide a workout to the upper parts of the body. The result is a total workout. These machines are efficient for fat loss exercises and they are said to provide results after few weekly workouts. The manufacturers of Versaclimber H boast to have made numerous sales in many gyms across the United States and are now making an extension to homeowners who would like to bring workout routines closer to home. Unlike many workout machines, the Versaclimber H models put into action several muscles at a go. 108H models have a height of 90 inches and a total weight of 86 Pounds. Both models can hold up to 350 pounds. A Versaclimber ranks well as the top mountain climber machine available on the market. Users find it helps by providing them with an option to adjust the load between the arms and legs. It also allows for side pushes and pulls. These side exercises can be adjusted to target the quadriceps which is effective for users seeking real challenges. Manufacturers of Versaclimber claim that this equipment can burn down over 180% of calories above most prototypical treadmills. As much as there is no known scientific proof to this, several types of research hold the opinion that many entire body workout equipment such as Vertical climbers normally burn down many calories than treadmills, riding a bike or even taking the stairs. The design of a Versaclimber is another thing that makes it most people’s favorite. It is fitted with adjustable grips and pedals. These handles can be adjusted to accommodate various heights thus making it suitable for different climbers. The adjustable height and a number of programs that are available increase the productivity of the Versaclimber in as far as keeping fit is concerned. A Versaclimber has a display module that provides users with three different operation modes namely; standard, race modes and program. On this display modules, users can view the workout progress in respect to time, rate of calorie burn, distance covered among others. There are 16 programs at users’ disposal. Modules can be adjusted according to user’s height and are simple to read. Most work-out machines are expensive. While choosing to invest in work-out equipment, it is prudent to have an understanding of the machine in question before spending your hard earned money on it. This is a detailed review of the Versaclimber; one of the best-selling mountain climber machine. The Versaclimber comes with a 3 year warranty. Manufacturers also say that they do provide users with one year warranty on spare parts and maintenance labor. Not many manufacturers will offer such warranty on sub-standard equipment; as such the durableness of this machine can be counted on. Versaclimbers are made from top quality aluminum. Manufacturers say this allows them to accommodate climbers who are heavyweight. As much as they are heavier than many vertical climbers, Versaclimbers are stable and easy to operate. People on a strained budget might find the Versaclimber expensive. There are other models of vertical climbers that can be acquired at a smaller percentage of the total amount that the Versaclimber costs. Nonetheless, a Versaclimber is arguably the best machine for people who require comprehensive body workout sessions. Not only does this equipment provide full workout but it also guarantees longevity and a better chance to track the workout progress. A Versaclimber has a height of 90 inches. This means that it can fit in many homes with a ceiling height of 8ft and above. It is also foldable thus can be easily stored away when not in use. The base of a Versaclimber occupies a space of 36×44 inches and thus doesn’t occupy a lot of space even when in use. Unlike many cheap vertical climbers, a Versaclimber needs several assembling tools. The assembling of Versaclimber may challenge new users but details on its assembling can be obtained on the manufacturer’s official website. The assembling tools include opening wrenches and hex keys. It provides users with total body workouts as compared to bikes, treadmills and other exercise machines. As seen above, the advantages of using the Versaclimber as the choice vertical climber exercise machine outweighs its disadvantages. The versatility of the Versaclimber as the choice vertical climber exercise machine is without a doubt. If you are a serious trainer, athlete or an exercise climber who need home workout sessions, then the Versaclimber is an ideal choice. As much as it is expensive, it has a longevity that can be trusted and users can expect a comprehensive body workout. 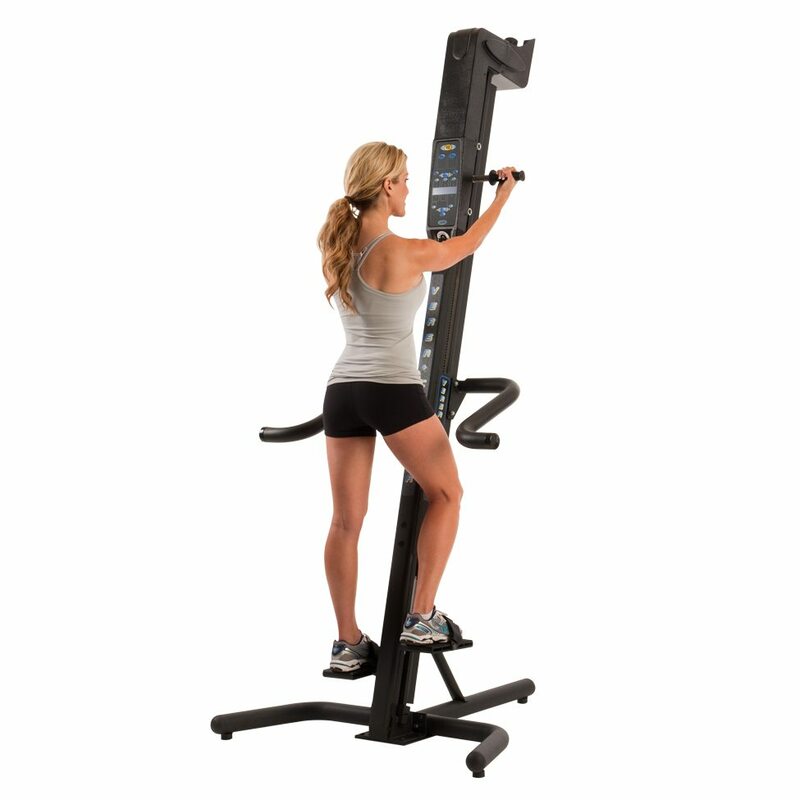 Versaclimber provides a step height of 1-20 inches. This provision is not guaranteed in other cheap vertical climbers. The display unit enables users to track their progress carefully; as such they get to improve with time. Nonetheless, beginners and casual trainers might find a Versaclimber way too expensive and might opt for less expensive vertical climbers. If you are keen on embarking on climbing machine workout, go for the Versaclimber – the ideal climb machine. In Addition to this you can find more information about Sunny Folding Climber Stepper.